Wednesday 10th August , 6:30 pm. Speaker: Gareth Williams, Founder and CEO, Skyscanner. What Skyscanner is and where we have got to. ... but hopefully generating lots of questions. 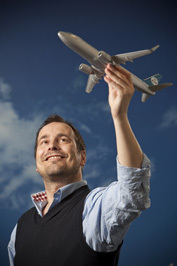 Self-confessed IT geek, Gareth Williams is the CEO of Skyscanner. Born in Norwich, Gareth was a globetrotter from an early age spending his upbringing in Sussex, Canada and Switzerland. Gareth became obsessed with computers going to Manchester University to study mathematics and computing. Going on to work as a programmer, Gareth became annoyed that it was so difficult to find cheap flights to ski with his brother in Val d'Isere so worked on the idea of an easy-to-use way of tracking the best travel deals ... and Skyscanner was born! Gareth lives in Edinburgh with his sons, Noah and Arthur.